Four more bodies have been found in the wreckage of two trains which crashed near Bologna, Italy, bringing the death toll so far to 17. The bodies were found more than a day after the crash on Friday, which also injured dozens of passengers. A regional express train collided head-on into a freight train, derailing its engine as the goods train ploughed into passenger carriages. Italian officials say the accident happened on a stretch of single-track. The head of the regional civil protection service, Demetrio Egidi, had earlier warned journalists the number of dead could rise. 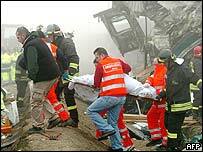 About 200 rescue workers battled thick fog at the scene of the crash to rescue passengers and treat the injured. Some of the carriages were derailed by the impact, which left one of the carriages vertical in the twisted wreckage. Heavy iron construction girders being carried by the goods train are said to have been hurled into one of the passenger carriages. "The girders which the freight train was carrying allowed it to stay on the tracks while the passenger carriage was shredded by the impact," said a spokesman for the Bologna fire department. Passengers have described their terrifying ordeal. "I can hardly speak. I am still in shock from the terror, the fear," one survivor told an Italian television programme. "I saw this thing I thought was a tree trunk or maybe a house, then I saw through the window on my right a carriage up this high, vertical." Firefighter chief Giuseppe Lo Presti said one carriage was "not only completely destroyed, but it has crumpled, while another carriage is hanging over the fourth passenger carriage". Visiting the scene of the crash near the town of Crevalcore, the country's Transport Minister, Pietro Lunardi, earlier said four of the dead were railway staff on board both trains. The nationality of the victims has not yet been established. Three investigations have been opened. The widow of the passenger train driver, Vincenzo Debiase, said her husband could not have caused the crash. "He was an experienced railwayman who knew the tracks by heart," she said. The crash happened on Friday at 1150 GMT on the Verona-Bologna route. The goods train was travelling from Bologna and the passenger train had left Verona at 1039 GMT. Visibility was only about 50m (160ft), due to persistent dense fog. Powerful search lights were used to help rescue workers locate trapped passengers.